On February 26, 2008, a cold front moved through west Texas, and winds died in the evening just as electricity demand was peaking. Over a 2 hour period the generation from wind power in the region plummeted rapidly from 1.7 GW to only 300 MW, while the power demand rose to a peak of 35612 MW from 31200 MW. The sudden loss of wind power and the lack of alternative electricity supply to ramp up as quickly forced the Electric Reliability Council of Texas (ERCOT)to curtail 1100 MW demand from industrial customers within 10 minutes and grid stability was restored within 3 hours. DLC is the most widely deployed technology today in the mass markets in the US and has been around for 50 years. Under direct load control (DLC), a utility or system operator remotely shuts down or cycles a customer’s electrical equipment on short notice to address system or local reliability contingencies. In exchange, the customer receives an incentive payment or bill credit. Certain applications are identified as “deferrable”, to run later in the day, after the peak. These applications will vary by region, but common loads include residential electric hot-water heaters, air conditioners, pool pumps, crop-irrigation pumps, etc. In a distribution network outfitted with load control, these devices are outfitted with communicating controllers that can run a program that limits the duty cycle of the equipment under control. The utility only exercises the equipment when necessary. The consumer is usually rewarded for participating in the optional load control program by paying a reduced rate for energy. Operation of DLC typically occurs during times of high peak demand. However, it can also be operated when economic to avoid high on-peak electricity purchases. The traditional DLC option is implemented as follows. During a DR event, DLC participants have their appliances turned off for the full duration of an event or for various fractions of an hour (e.g., a common duty cycle is 15 minutes off during an hour). A one-way remote switch is connected to the condensing unit of an air conditioner or to the immersion element in a water heater. The operation of the switch is controlled through radio signals (for older systems) or through digital paging (for newer systems). Most switches also contain multiple relays so that air conditioners and water heaters can be controlled by the same switch with independent control strategies for each relay. More recent DLC programs involve installation of programmable communicating thermostats for customers. Smart thermostats allow remote adjustment of temperature settings, so the utility can remotely adjust the temperature upward to reduce demand. After an event, the temperature setting is readjusted to the pre-event, customer-selected level. BIP - Base Interruptible Program - Allows participants to nominate a level of "firm" service (the amount of electricity necessary to meet operational requirements during an interruption) that is below their historic average maximum demand. They receive a monthly incentive payment based on the size of the remaining, curtailable portion of their load, in return for committing to reduce to the firm level when called upon by the utility. The incentives are typically about $7 per committed kW per month for curtailment of 15% of load when called by the utility with 30-minute notice. There is a minimum drop of 100 kW per event. PG&E and SDG&E, however, offer a longer, 3-hour, notice in exchange for a lower incentive option ($3/kW). Curtailment requests cannot exceed one per day (of up to four hours), ten per month, or 120 hours per year (90 hours for the lower incentive options). Penalties apply for customers that fail to reduce load as requested—the amount depends on the utility and the incentive option. All three utilities have now contracted with numerous third-party aggregators who recruit customers to participate in BIP and manage their participation process. By serving as an intermediary, the aggregators can handle many of the details on customers' behalf and help them develop load reduction strategies. The aggregators may also offer innovative program features—for example, by assuming the risk of non-compliance penalties or by allowing customers to participate who might otherwise be too small to enroll directly in the utility's program. CBP - Capacity Bidding Program - Participants receive a monthly incentive to reduce their energy use to a pre-determined amount once a CBP event is called by the utility. Customers also have the option to directly enroll or go through a third-party aggregator to join the CBP. Optional Binding Mandatory Curtailment Program – Offered by PG&E and SCE - Provides customers with exemption from rotating outages if they can reduce their circuit load during Stage 3 Emergencies. Participants must reduce their power consumption by 5-15% for the duration of every rotating outage event. The penalty for failure to reduce as requested is $6.00 per kWh for energy use that exceeds an established baseline. Summer Air Conditioning Cycling Program Offered by SCE and SDG&E to their commercial customers through SCE's Summer Discount Plan and SDG&E's Summer Saver program. These programs provide a credit on participants' summer season electric bills in return for allowing the utility to cycle air conditioners when needed during the months of May to September. Customers can choose among several options regarding the frequency and duration of curtailments, each with corresponding remuneration levels. A Smart Grid will facilitate the implementation of all types of load control programs beyond just demand response, due to its advanced control features. The smart grid concept also includes traditional load control programs used by many utilities to cycle water heating and air conditioning equipment during peak demand periods. Results of several dozen utility experiments show that a combination of equipment control and price feedback technologies often doubles the impacts of load controls. Most residential and commercial programs consist of a relatively small number of participants, relative to utility populations. 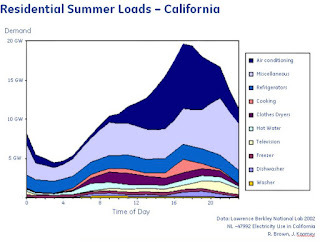 The advanced control capabilities of devices operating within a Smart Grid will make it easier for utilities to implement other types of load control technologies such as load-limiting devices that may yield more permanent peak demand reductions, as distinguished from demand response programs that yield temporary peak load reductions. Smart grid technologies can provide traditional load control functions, cycling air conditioning, water heating and swimming pool pumps, while more advanced options provide individual equipment control to these and additional end uses through programmable devices accessible by both the utility and the utility customer. These technologies permit households to respond to a price signal to lower thermostat setting and schedule major electric appliances. Energy Savings – Load control programs implemented in the U.S. in 2005 yielded peak demand reductions of 10,359 MW and energy savings of 1.01 billion kWh. The programs resulted in energy savings of 97 kWh for each kW of peak load reduction. 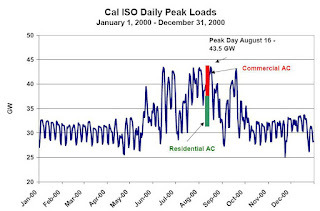 The average ratio observed over the last ten years of peak load management programs tracked by the U.S. Energy Information Administration is 113 kWh of energy savings for each kW of peak load reduction, which is considerably is higher than the 65 kWh/kW ratio observed for recent Auto- DR programs. The variance may be due in part to the more permanent nature of some of the non-demand- response load control efforts. Dispatchabilty - Load reduction associated with DLC takes place instantaneously and there is no notification time. Lack of Feedback - The idea of one-way load control systems, where you just turn things on and off, seems to be receding. In its place is coming a next generation product that offer a much more collaborative process of allowing consumers to opt in and opt out. Aging DLC Infrastructure - In many parts of the country DLC switches are aging. In many cases people have said that only 70 percent of the switches actually work. Payments - There are concerns about how much do you have to pay in order to get that reduction in load. And there are people who are trying to cut back the amount of payments they make because they feel they have too many free riders. Economic Development Rates - Curtailable and interruptible rates were developed for a particular objective in mind and in many parts of the country they have actually morphed into becoming economic development rates. And so people didn't expect to be interrupted, they were just getting a discount. And so when the interruption suddenly arrived there was a lot of concern as to what was going on. Operations/Maintenance Cost - Once a utility installs control device; they “own” most calls regarding failed appliances. Often incur control equipment removal cost 2, 5, even 15 years later. With direct load control, the utility owns the risk for failure of control equipment or communication signal. Residential Feedback - What we have today is that conventional air conditioner load control switches, that generally will sell for about $75 to $100 apiece. They are in wide use by lots of utilities, including California utilities. They are subject to a lot of factors that affect their performance. Although one of the factors is that because of the nature of that device the utilities, once they install them, really have no idea whether they are still working or even in place. And because air conditioners have a useful life of maybe 13 to 15 years, a certain percentage of air conditioners and their switches wind up in a landfill somewhere every year, unbeknownst to the utility. Studies indicate that customers want to know when direct load control measures are in effect. The DR solution shall provide the ability to manage direct load control programs. It accomplishes this by managing the transmission of direct load control actions to direct-load-control-enabled devices, shown as device, HAN device, and smart appliances. This solution will also provide interactions with customers to convey direct load control information. Peak Load Management Alliance - Market Potential Study for Water Heater Demand Management Rebecca Farrell Troutfetter, Frontier Associates LLC, Austin, TX - Water heating represents between 13 and 17 percent of residential energy consumption nationwide. Based on the 2007 Census data, roughly 42 percent of all homes in the U.S. have electric water heating; this equates to over 53 million homes. With such a high saturation of electric water heating nationwide, direct load control for water heaters has high potential for reducing peak demand, especially to help offset summer peaking driven by electric air conditioning use.